The New York City Department of Education supports lesbian, gay, bisexual, transgender, and queer or questioning (LGBTQ) students, families, and staff across the five boroughs through a variety of policies and programs. The DOE has more policies than the ones listed above. For more information on all NYC policies, go to the top navigation and click on School Life, then look under the heading Policies for All. 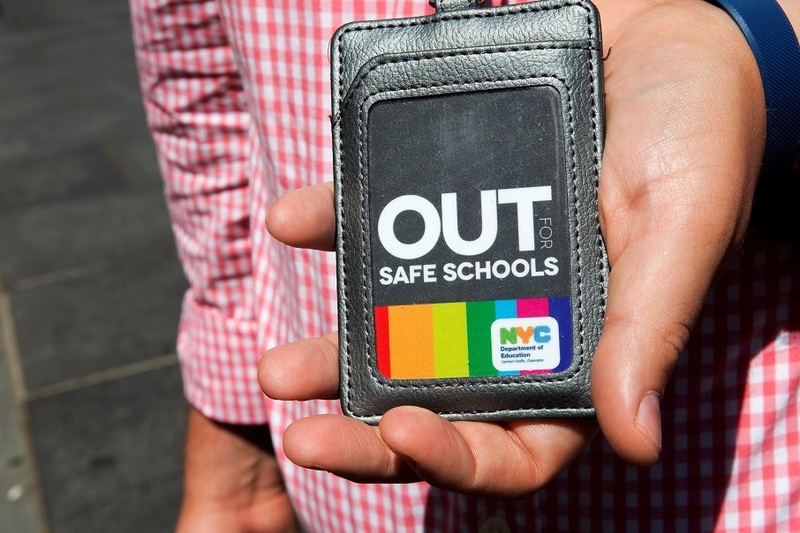 The OUT for Safe Schools® campaign is a national initiative that supports school-based staff to visibly identify as trusted adults to LGBTQ students. School staff receive training in building affirming environments for LGBTQ students before receiving badges for the school community. All students in the New York City Department of Education should graduate ready for college and careers. Many students may use resources like NYC College Line to research colleges and plan to finance college, but for LGBTQ students there are other considerations such as finding an affirming environment and sometimes paying the tuition without parental support. The following resources are meant to support LGBTQ students and their families in finding and financing college. A GSA is a club, typically in a high school or middle school, which provides a place for students to meet, support each other, talk about issues related to sexual orientation and gender identity and expression, and work to end harassment or discrimination for LGBTQ students. The clubs are also a great place for all kids to get support, including allies and children of LGBTQ parents. Chancellor’s Regulations are the NYC Department of Education policies that schools must follow. Chancellor’s Regulation A-601 talks about activities, clubs, and organizations and says that any student can start a student club as long as they follow the rules. You have to let everyone in. It has to be open to everyone in the school and you cannot charge a membership fee or make it a secret club. Every school has their own rules. For example, in some schools the principal asks that student government approves all clubs, and in other schools the club has to submit a proposal to the principal before they get started. The best, first step is for an interested student to approach a trusted adult in their building, perhaps a guidance counselor, the Respect for All liaison, a supportive teacher, or maybe even the principal. Let them know that you'd like to start a GSA and ask them what the process would be. If they need help or support, they can email us at lgbt@schools.nyc.gov. Curriculum is both a window and a mirror, allowing students who are not LGBTQ to see the experiences of others and providing a reflection for LGBTQ students. These efforts include incorporating LGBTQ history, reading books by LGBTQ authors, and ensuring sexual health curriculum is inclusive of all identities. The DOE maintains a list of groups that offer resources for LGBTQ individuals at the following link. Learn about events, opportunities, and training sessions offered throughout the city; don't forget to check back frequently to see updates.